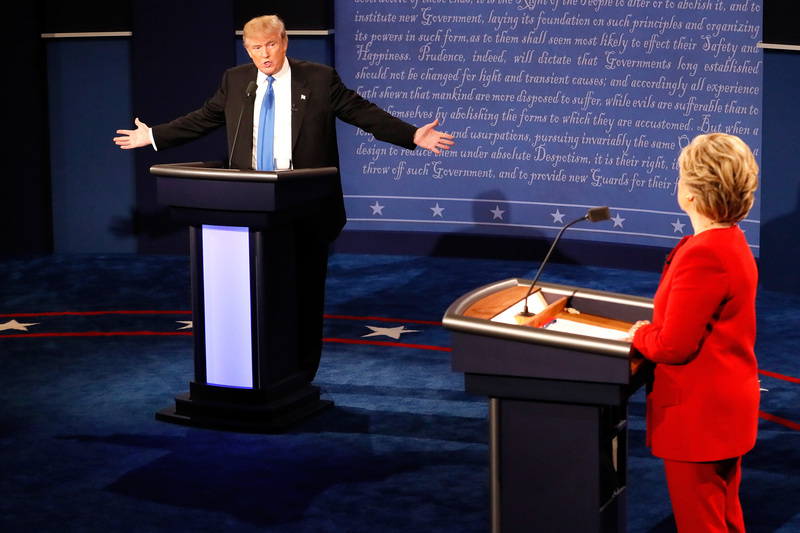 Hillary Clinton and Donald Trump held their first face-to-face debate last night in a 90-minute event that could be crucial in the race for the White House. And among everything else the world took away from the event, the debate taught us something very important – everyone thinks Donald Trump may be a coke user. It all started when a fair few social media users noticed Trump was sniffling. A lot. His observation has so far been retweeted and liked a combined 54,000 times in the 12 hours since posting. Q: What's orange and tastes of coke? Trump is the kid in your high school class who shows up unprepared to give an oral report, so he recites random "facts." And is on coke. While the truth of whether or not Trump is actually on blow remains unknown, it’s not the only shocking claim to come out of last night’s presidential election. Trump interrupted Hillary – a lot. At Monday night’s presidential debate, Donald Trump interrupted Hillary Clinton 25 times in the first 26 minutes of the debate. By the time the debate was over, Trump had interrupted Clinton 51 times — whereas Clinton had interrupted Trump just 17 times, according to a count by Vox. Both candidates were caught fibbing by fact-checkers during the debate. Fact-checkers caught both Trump and Clinton fibbing about past statements during the debate. Trump denied Clinton’s claim that he had said climate change ‘is a hoax perpetrated by the Chinese’. Meanwhile, Clinton denied saying she had called the Trans-Pacific Partnership trade deal ‘the gold standard of trade deals’. The debate was less of a debate, and more of a shouting match. All presidential debates have their heated moments but The Telegraph reports that experts are saying they’ve never seen anything quite like this one. In a debate that should have been civilised and professional, the first of three presidential debates between the candidates grew vitriolic and personal. The first seven words Clinton spoke to Trump at the beginning of the debate – ‘Donald, it’s good to be with you’ – was about the only polite interaction of the evening. Over the next 90 minutes, Trump accused of her of achieving nothing during her lengthy career, and said, contrary to popular belief, he had ‘a better temperament’ than his rival. She, in turn, sought to highlight him as a failed businessman who would do nothing to help America progress, saying he was not interested in science and ignored facts. Donald Trump doesn’t have great references. During the debate, Trump implored viewers to call Fox News host Sean Hannity, who he insisted would vouch that Trump had opposed the Iraq war early on. Former Obama speechwriter Jon Favreau made the call on his podcast, Keepin’ It 1600. Hannity, an avid Trump supporter, hung up almost immediately. Five million people tweeted about the debate – mostly about Trump. According to the BBC, five million people were tweeting about the presidential debate – 62 per cent were about Trump, 444,000 were about NBC presenter Lester Holt, and 10,500 were about #UnlikelyDebateGuests. Last night's debate showed the world how unfit Donald Trump's candidacy would be. Sniffing, drinking water, losing train of thought now up at 2.30 am scouring the Internet. What's going on with Donald trump? So, who won? Well, it depends who you ask. A CNN/ORC poll found that 62 per cent of voters thought Clinton came out on top, with just 27 per cent giving the bout to Trump. However, only 26 per cent identified themselves as Republicans while 41 per cent identified themselves as Democrats. An informal CNBC poll on its website has found 61 per cent of people thought Trump won, while 39 per cent went for Clinton. Trump has tweeted the results, but as CNBC points out, the poll is ‘not scientific’. Anyone, including those outside the U.S, appears to be able to vote. But we won’t know for sure who will actually be the next President of The United States until the November 8 election. Countdown to judgement day.